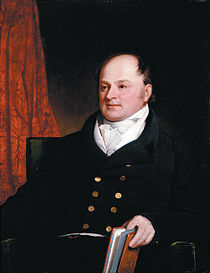 Secretary of State John Quincy Adams, author of the Monroe Doctrine. The Monroe Doctrine was a foreign policy proclaimed by the United States in 1823 during the presidency of President James Monroe. It said that European powers do not belong in The Americas. For example, it would have been against the Monroe Doctrine for Spain to try to take back its colonies in South America. This page was last changed on 9 October 2013, at 15:11.